It’s seems like a day for making chicken salads and I got in this mood and made 2 of them. 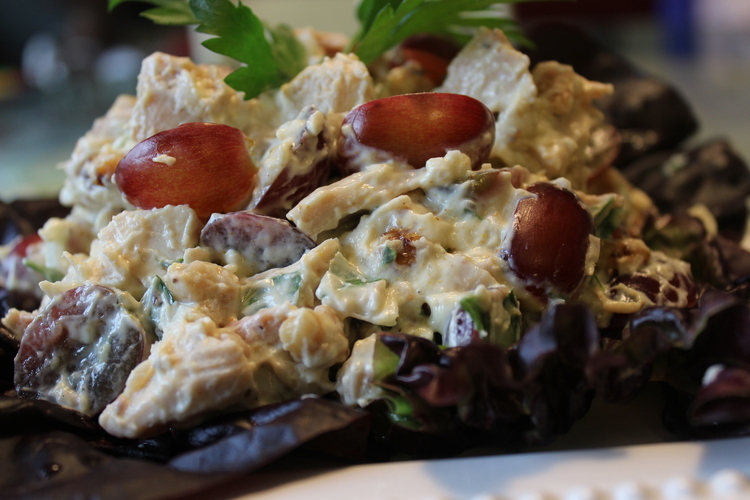 This Curry Chicken Salad and an Avocado Chicken Salad – lighter version. Both were made with light mayo and Greek yogurt mixed with chopped onion. For this one I added honey and curry powder. Try the recipe and tell me what you think. It’s pretty good!!! Chop chicken into 1/2- 1 inch cubes. Saute walnuts in melted butter and 1 T. sugar for a few minutes until walnuts start to brown a little. Do not let them burn. Set aside and let cool on a paper towel. When walnuts are cool mix with chicken and grapes in a medium bowl. Mix together low fat mayonnaise, Greek yogurt, chopped onion. Add curry powder, honey and salt and pepper. Taste for seasoning and add more salt and pepper if needed. Stir the sauce into the chicken, walnuts and grape mixture. Adjust seasonings and add more curry powder, honey or salt and pepper if needed. Serve on romaine lettuce or can be served in a croissant roll. Makes 4 small servings or 6 croissant sandwiches.